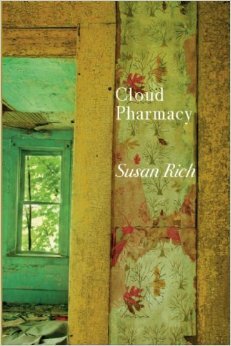 In Susan Rich’s Cloud Pharmacy, we are at a mid-point, a reflective moment in a sincere and eventful life. We drift and we hover, but not passively. Cloud Pharmacy determinedly asks: Why chose to live this one life reluctantly? It’s so hard to say what the dead really want. descriptions, we lose our blue hours. Wildfire acts as a metaphor for cleansing and transformation throughout the collection, surfacing in poems such as “There Is No Substance That Does Not Carry One Inside Of It”, “Burning Bush” and “The World No Longer Resembles Itself”—the last of which is based on a very real wildfire that Rich experienced in Mojacar, Spain, in August 2009. The searing fires within the poems are often cooled by the recurring color blue. The color splashes around in nearly every poem and acts as a touch of balm when the reader needs it most. Blue seems to signal reflection, a chance to process what the fires have incited in the speaker. In “Blue Grapes”, the opening poem, Rich asks: “How to write your one blue life?” The question foreshadows the need for healing when one begins the fiery task of examining life through writing. a middle pancake gone wild. An arm slipped under your waist while you slept? signals above us in blue transparent space. into porcelain light and shadow. unwavering dark-sky stare—recognized my own pathology. or remaining lonely as brooms. How do I knot my tie? Katy E. Ellis grew up under fir trees and high-voltage power lines in Renton, Washington. She teaches creative writing through Seattle Arts & Lecture’s Writers in the Schools (WITS) program and at The Family Learning Program, a home school education organization. Aside from her chapbooks Urban Animal Expeditions (Dancing Girl Press) and Gravity (Yellow Flag Press), her poetry has appeared in a number of literary journals and anthologies including PRISM International,Literary Mama, Floating Bridge Review, MAYDAY Magazine, Redheaded Stepchild, Calyx: A Journal of Art and Literature by Women, Borderlands: Texas Poetry Review, and the Canadian journals Grain and Fiddlehead. She lives in West Seattle with her husband and daughter.